MELBOURNE, Florida - A Brevard County woman was dragged along a gas station parking lot when she attempted to stop a thief from stealing her car in Melbourne, Florida. 30-year-old Brandy Johnson had pulled into a Chevron gas station located at the intersection of Babcock Street and Brevard Avenue on Sunday, November 6, 2016. When Johnson left her vehicle to go inside to the Food Mart, a man lurking nearby walked up to the vehicle, opened the door, and sat in the driver's seat. 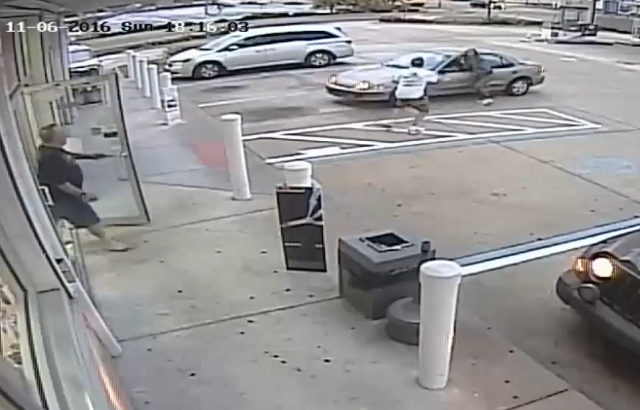 Video shows Johnson running out of the store to intercept the car thief. However, the man reversed the car while Johnson's arms were through the open window, which caused her to be dragged across the parking lot. Bystanders also attempted to help stop the auto theft, but the man was undeterred and drove away with the vehicle. The Melbourne Police Department is asking the public's help in identifying the suspect who was captured on surveilance video. Police ask that anyone with information about this incident to call CRIMELINE at 1-800-423-TIPS (8477) or the Melbourne Police Department at 321-608-MPD1 (6731).